Worx is a relatively new outfit, and we haven't tested any of their kit before here at WPP. It's always interesting to try out a new manufacturer... and sometimes a bit surprising. The price tag for this 12v, from their Icon range, is around £70, with charger and a spare battery, so not the cheapest, but definitely not the most expensive either. 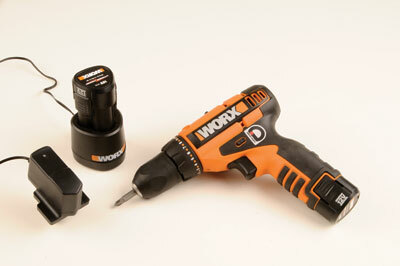 Worx have a Pro and DIY range of tools, and this Icon range is their orange liveried DIY range. 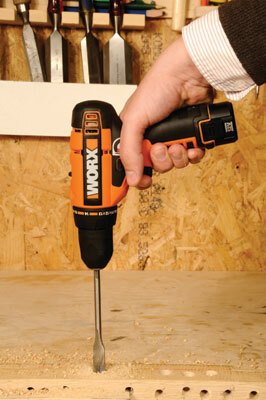 And for the DIY-er, and even for a back-up for pros, this drill hits the mark. If you've ever picked up a cheap and nasty drill/driver, you know the feel they have - if you sneezed on them they would break. Happily, this little Worx drill has the feel of a higher range machine. The gearing and motor have that sound and feel. The keyless chuck works easily and well, though is subject to a bit of wobble as it turns. The trigger, forward and reverse switch and speed selector all seem solid, as does the 15+1 position torque ring. The overmould rubber handle is comfortable, and the batteries slot effortlessly in and out of the handle. My only gripes really are the fairly long charge time at between 3-5 hours (although by no means unusual), and the fact there is no light indicator actually on the charger unit itself, just on the back of the plug. But these are minor irritations - the indicator on the back of the plug works just fine. All in all, this little fellow will get a lot of use in our workshop, and I'm quite sure it won't let us down.